Reginald Alfred Bush Jr. (born March 2, 1985) is a former American football running back. He played college football at USC, where he earned consensus All-American honors twice and won the Heisman Trophy (later forfeited) as the most outstanding player in the nation. He was drafted by the New Orleans Saints second overall in the 2006 NFL Draft. While with the Saints, Bush was named an All-Pro in 2008 and won Super Bowl XLIV in 2010 over the Indianapolis Colts. He also played for the Buffalo Bills, Miami Dolphins, Detroit Lions, and San Francisco 49ers. Bush also won the 2005 Doak Walker and Walter Camp awards. However, allegations that he received improper benefits were central to an NCAA investigation of the USC football program that led to severe NCAA sanctions against USC, including a two-year postseason ban and the vacating of the 2004 national championship. As a result, Bush voluntarily forfeited his Heisman Trophy. Bush was born in 1985 in Spring Valley in San Diego County, California, and named for his biological father, Reginald Alfred Bush, Sr. He was a running back at Helix High School in La Mesa, California. While at Helix, he played with 2004 Heisman Trophy finalist Alex Smith. During his prep career with the Helix Highlanders, he won the prestigious Silver Pigskin trophy awarded by KUSI's Prep Pigskin Report. Smith and Bush were later finalists for the 2004 Heisman, making it the first time a high school had two finalists at the same ceremony. He played in the 2003 U.S. Army All-American Bowl. Considered a five-star recruit by Rivals.com, Bush was listed as the No. 1 running back in the nation in 2003. Bush was also a track star at La Mesa, placing second (10.72) -1.7m in the 2002 CIF California State Meet 100 meters final and posting bests of 10.42 seconds in the 100 meters (both the fastest prep time in the state, and among the nation's senior footballer players) and 21.06 seconds in the 200 meters (third fastest prep in California in 2002). Bush is still 2nd all time on the 100m dash all-time list for San Diego. He placed second in the boys' 50 meters, clocking at 5.85 at the 2003 Los Angeles Invitational Indoor Meet. Reggie Bush at USC's 2004 BCS National Championship celebration. Bush received an athletic scholarship to attend the University of Southern California, where he played for the Trojans from 2003 to 2005 under head coach Pete Carroll. When Carroll recruited Bush he envisioned using him as a five-way threat. [clarification needed] The freshman quickly proved effective in carrying, catching, throwing, and returning the ball. Bush was a consensus first-team Freshman All-American selection in 2003, and became the first Trojan since Anthony Davis in 1974 to lead the Pacific-10 Conference in kickoff returns. His 1,331 all-purpose yards set a USC freshman record. The ESPN Pac-10 Newcomer of the Year also amassed 521 yards rushing that year, with three touchdowns on 91 carries. University of Utah quarterback Alex Smith and Bush were both finalists for the 2004 Heisman Trophy, making it the first time a high school had two finalists at the same ceremony. In 2004, Bush finished fifth in the Heisman voting and was named the team's MVP. He earned consensus All-American honors and was a finalist for the Walter Camp Player of the Year Award. He finished second on the team with 143 carries for 908 yards (6.3 avg) and six touchdowns, adding 509 yards and seven scores on 43 receptions (11.8 avg). Bush returned 21 kickoffs for 537 yards (25.6 avg) and 24 punts for 376 yards (15.7 avg) and a pair of touchdowns. He became the first Trojan since Marcus Allen to lead the Pac-10 in all-purpose yardage, totaling 2,330 yards. He also threw for one touchdown, tossing a 52-yard scoring strike. In 2005, Bush was a unanimous first-team All-American and winner of the Heisman Trophy. He was also named the Associated Press College Football Player of the Year, the Pigskin Club of Washington, D.C. Offensive Player of the Year, and the Touchdown Club of Columbus (Ohio) Player of the Year. In addition to the Walter Camp Award, Bush also won the Doak Walker Award, which is given to the nation's best running back. He led the nation with an average of 222.3 all-purpose yards per game and finished fourth in the NCAA Division I-A ranks with an average of 133.85 rushing yards per game. He set the Pac-10 record for all-purpose yards in a game, with 513 (294 rushing, 68 receiving, 151 return) against the Fresno State Bulldogs on November 19, 2005. Bush also became known for the "Bush Push," which occurred on a game-winning score against the Notre Dame Fighting Irish. Bush led the Trojans with 1,740 yards on 200 carries (8.7 avg) with sixteen touchdowns and ranked third on the squad with 39 receptions for 481 yards (12.9 avg), including a pair of scores as a junior. He returned 18 punts for 179 yards (9.9 avg) and a touchdown, and gained 493 yards on 28 kickoff returns (17.6 avg). Bush started only fourteen times in 39 games at USC. However, he finished tenth in NCAA Division I-A history with 6,541 all-purpose yards, racking up 3,169 yards and 25 touchdowns on 433 carries (7.3 avg) and 1,301 yards with thirteen scores on 95 catches (13.7 avg). Bush returned 67 kickoffs for 1,522 yards and a touchdown, adding 559 yards and three scores on 44 punt returns (12.7 avg). He also completed one of three pass attempts for a 52-yard touchdown. On January 4, 2006, Bush and Leinart became the first pair of Heisman Trophy winners to play together for the same team in a single game, against the Longhorns in the Rose Bowl. Bush amassed a total of 279 all-purpose yards (82 rushing yards, 95 receiving yards, 102 kickoff return yards) and one touchdown, but he was overshadowed in a losing effort by Heisman runner-up Vince Young and Bush's teammate LenDale White, who led USC in rushing with 123 yards and three touchdowns. Bush also attempted to lateral when he was tackled after a long run in the second quarter, but the lateral fell to the ground and was recovered by the Longhorns. This game gave Bush a total of 6,890 all-purpose yards for his college career. In 2006, reports surfaced raising questions about whether Bush's family received gifts in violation of NCAA policies. The school requested that the conference investigate the matter, and Bush denied any impropriety. Sports agent Lloyd Lake sued Bush and his family in November 2007 for not repaying over $290,000 in gifts. Lake also agreed to cooperate with the NCAA. In April 2009, the Los Angeles Times reported that the NCAA had merged its investigations of Bush and former USC basketball player O. J. Mayo into a single probe of the Trojans athletic programs. On December 28, 2009, it was announced that Bush had lost his bid for confidential arbitration in this matter and that the case would proceed to trial. The case was settled in April 2010. On June 10, 2010, the NCAA announced major sanctions against USC. The NCAA found that Bush had received lavish gifts from Lake and his partner, Michael Michaels, from at least December 2004 onward, including a limousine ride to the 2005 Heisman Trophy presentation. As a result, USC was given four years of probation and forced to vacate its last two wins of the 2004 season – including the 2005 Orange Bowl – as well as all of its wins in the 2005 season. The Trojans were also banned from bowl games in 2010 and 2011 and lost 30 scholarships over three years. Running backs coach Todd McNair was banned from off-campus recruiting for one year after the NCAA determined he had known about Bush's dealings with the agents. McNair sued the NCAA for damages related to his dismissal and the NCAA lost. The judge in the case found the NCAA conducted the USC investigation and that of McNair with "malice". The NCAA also forced USC to permanently disassociate itself from Bush. The NCAA determined that, given Bush's high-profile status, USC should have invested more effort in monitoring Bush's relationships. In announcing the penalties, NCAA infractions committee chairman Paul Dee said, "High-profile players merit high-profile enforcement." On July 20, 2010, incoming USC president Max Nikias stated that the school would remove from its facilities all jerseys and murals displayed in Bush's honor, and would return the school's copy of Bush's Heisman Trophy. On August 12, USA Today reported that Bush had called USC's new athletic director, Pat Haden, and apologized for making poor decisions that led to the NCAA sanctions. However, in a subsequent report in the Los Angeles Times, Haden said that the characterization of Bush's call as an "apology" was incorrect; Haden described it as "a conversation of him being contrite, but not an apology", and he also noted that Bush had not admitted to any specific wrongful acts. Won the Heisman Trophy in 2005, beating finalists Vince Young and 2004 Heisman winner and teammate Matt Leinart. After a NCAA investigation in 2010 ruled he was ineligible to participate as a student-athlete at USC, Bush became the first player in the history of the Heisman Trophy to forfeit the award. On January 12, 2006, Bush elected to forgo his senior season at USC and declared himself eligible for the NFL Draft. Bush's on field performances made contender for a top pick in the 2006 NFL Draft, and he also made an impressive appearance at USC's highly publicized post-season pro day showcase, where he ran the 40-yard dash in 4.33 seconds. Draft analysts predicted that he would be the first overall pick in the draft, a pick held by the Houston Texans. However, in a surprising move on the night before the draft, the Texans signed Mario Williams, a defensive end from North Carolina State University, meaning that Bush would not be the first draft pick. Bush's representatives spoke that night with the New Orleans Saints, who said they intended to use the second overall pick to select Bush. Bush was indeed drafted by the Saints with the second overall pick in the 2006 NFL Draft. The Houston Texans' decision to not take Bush was derided by many sports analysts. At the time, ESPN commentator Len Pasquarelli claimed that Houston selecting Williams ahead of Bush was one of the biggest mistakes made in NFL Draft history. Bush was second to Peyton Manning in NFL endorsement deals, amounting to roughly US$5 million annually. He signed contracts with Pepsi, General Motors, Adidas, Pizza Hut and the Subway restaurant chain. Amazed by the warm reception he received from the fans in New Orleans as well as the magnitude of the devastation caused there by Hurricane Katrina, Bush expressed excitement about playing with the Saints and pledged to help the city recover from the hurricane. On May 15, 2006, Bush donated US$50,000 to help keep Holy Rosary High School, a Catholic school for students with learning disabilities, from closing. During training camp, Saints receiver Joe Horn dubbed him "Baby Matrix" because of his seemingly impossible evasive maneuvers (apparently comparing him to the movie The Matrix, which features characters who move faster than humanly possible to dodge bullets). Bush's rookie season had both ups and downs, although as the season wore on he became more productive and integral to the Saints' surprising success. In the first game of Bush's NFL career, he amassed 141 total yards against the Cleveland Browns. He carried the ball fewer times than his counterpart Deuce McAllister, putting off any speculation that he would immediately supplant McAllister as the starter in New Orleans. The Saints won the game by a score of 19–14. In his team's week 9 contest against the Tampa Bay Buccaneers, Bush finished the game with −5 yards on 11 carries despite the Saints' 31–14 victory. This effort lowered his league-worst rushing average among running backs to only 2.55 yards per carry. However, he finished the midway point of the season with 46 receptions, the most by any running back in the league. At the midway point of the season, Bush had yet to score a touchdown either receiving or running the ball; however, on November 12, 2006, Bush rushed for his first touchdown from scrimmage on a reverse against the Pittsburgh Steelers. On December 3, Bush tied the Saints' single-game touchdown record, held by Joe Horn, by scoring four touchdowns against the San Francisco 49ers. He gained 168 all-purpose yards as he sparked the Saints to their eighth win of the season. On December 10, Bush scored a 62-yard touchdown against the Dallas Cowboys in Dallas, contributing to the Saints' 42–17 drubbing of the Cowboys in what was expected to be a more competitive matchup that would be important to the playoff race. On December 24, Bush scored a one-yard touchdown on a reverse against the New York Giants. Bush also had a career-high 126 rushing yards on the day. On December 31, Bush scored a one-yard touchdown against the Carolina Panthers but carried the ball only three times, even though backfield counterpart Deuce McAllister did not play. This was because the New Orleans Saints had already clinched the No. 2 NFC seed in the playoffs. In the NFC Divisional Playoff game on January 13, 2007, Bush ran for 52 yards on 12 carries and scored a touchdown, and added three catches for 22 yards, as New Orleans edged the Philadelphia Eagles 27–24 to earn its first NFC Championship Game appearance in the team's 40-year history. The game was also notable for the vicious hit that Bush absorbed from Sheldon Brown while attempting to catch a swing pass on the Saints' first play of the game. On January 21, in the NFC Championship playoff game, Bush caught a pass on the 22 and ran 78 yards downfield (eluding the Chicago Bears safety) for an 88-yard touchdown thrown by Drew Brees. This comeback was the first score of the second half and closed the gap from 16–7 (in favor of Chicago) to 16–14. That was the last time, however, the Saints would score. The Bears went on to trounce the Saints 39–14 to earn a berth to the Super Bowl. Bush was fined by the NFL after the game for US$5,000 for taunting: which consisted of wagging his finger at All-Pro linebacker Brian Urlacher and doing a somersault after the 88-yard reception score. Bush apologized immediately after the event. In the season opener of the 2007 season, Bush and the Saints lost to the defending Super Bowl champion Indianapolis Colts 41–10. Bush was tied for a team-best 38 rushing yards on 12 carries. He also had seven yards on four receptions and a punt return for two yards in a disappointing opener for him and the Saints. Their next game was equally as disappointing, as the Saints were beaten 31–14 by the Tampa Bay Buccaneers and Bush averaged 2.7 yards per carry and 27 yards from scrimmage – over a third of which came on one play. Bush scored two rushing touchdowns, both one-yard runs, in the Saints' Week 3 loss to the Tennessee Titans. In that game, Bush carried seven times for 15 yards while catching six passes for 20 yards. Bush missed the final four games of the 2007 season with a partially torn posterior cruciate ligament in his left knee. Bush finished the season with six total touchdowns and 581 yards rushing, averaging 3.6 yards per carry. Bush was injured in the October 19 game against the Carolina Panthers. He had surgery to repair a torn meniscus in his left knee the next day and was expected to miss the next three to four games. Bush returned on November 30 against the Tampa Bay Buccaneers and registered three carries for no yards and five catches for 32 yards in a 23–20 Saints loss. However, one week later he was back on track, producing over 100 yards from scrimmage and a touchdown catch in an important 29–25 home win against the division rival Atlanta Falcons to keep the Saints' slim playoff hopes alive. On December 11, Bush sprained his medial collateral ligament in his left knee in the Saints' 27–24 overtime loss in Chicago. Although diagnosed as a sprain, given that it was the same knee he had surgery on earlier in the year – and that the Saints were now out of the playoff picture with only two games left in the 2008 season – Bush was placed on injured reserve, ending his season early for the second year in a row. He finished the season with 404 rushing yards on 106 carries, 440 yards receiving with 52 receptions and nine total touchdowns, playing in ten games. On January 7, 2009, the New Orleans Saints confirmed that Bush had surgery on his left knee, and would require months of rehabilitation. However, Bush was expected to be ready for minicamp in June. Bush missed games in weeks 11 and 12 of the regular season due to soreness in his surgically repaired knee. He also missed most of game 15 due to a minor hamstring injury. Bush at the Saints' Super Bowl XLIV victory parade. On January 16, 2010, in the NFC divisional playoff game against the Arizona Cardinals, Bush had one of the best games of his pro career. He rushed for 84 yards on only 5 carries, including a 46-yard touchdown run. This play was the longest run by a New Orleans Saints player in the postseason. He also added an 83-yard punt return touchdown late in the third quarter, the Saints' last score in their 45–14 win. In the NFC Championship Game against the Minnesota Vikings on January 24, Bush had only 8 yards rushing on 7 carries with 2 receptions for 33 yards, and he fumbled a punt return. However, one of his receptions was a late touchdown that helped the Saints win their first NFC championship and their first Super Bowl appearance and eventual victory in franchise history. On February 7, 2010, Bush won his first Super Bowl with a 31–17 win over the Indianapolis Colts in Miami. Bush's 2010 season was overshadowed by the controversy over his Heisman Trophy, as well as other matters related to his years at USC. During the second regular-season game, a Monday Night Football contest with the San Francisco 49ers, he was injured while returning a punt. He did not return to the game. The injury was diagnosed as a broken bone in his right leg and he was expected to miss at least six weeks. He returned on Thanksgiving Day to play against the Dallas Cowboys. Overall, he finished the 2010 season with 150 rushing yards and 34 receptions for 208 yards and a receiving touchdown. On July 28, 2011, the Saints traded Bush to the Miami Dolphins for reserve safety Jonathon Amaya and a swap of sixth-round draft picks. After an 0–7 start, during the Dolphins' first win of the 2011 season against the Kansas City Chiefs, Bush scored his first rushing touchdown since 2009. Bush also had his second career 100-yard game against the New York Giants with 103 yards on 15 carries. In Week 13 Bush rushed for 100 yards and a touchdown on 22 carries in a 34–14 win over the Oakland Raiders. Bush again eclipsed the 100-yard mark in a loss to the Philadelphia Eagles the following week, rushing for 103 yards on 14 carries. On December 18, Bush rushed for a career-high 203 yards and a touchdown on 25 carries in a 30–23 win over the Buffalo Bills. Bush rushed for 113 yards on 22 carries on Christmas Eve in a losing effort at the New England Patriots. Early in the game, he eclipsed the 1,000-yard rushing mark in a season for the first time in his professional career. Overall, in the 2011 season, he finished with 1,086 rushing yards, six rushing touchdowns, 43 receptions, 296 receiving yards, and one receiving touchdown. After a solid season opener against the Houston Texans with 69 yards, Bush broke out on the ground with 172 yards on a career-high 26 carries and two rushing touchdowns, as well as 25 reception yards, in a 35–13 win over the Oakland Raiders. Bush was named AFC Offensive Player of the Week for week 2, the second time since joining the Miami Dolphins, and third time in his career (once in 2006 with the New Orleans Saints). On December 23, against the Buffalo Bills, he had 65 rushing yards, one rushing touchdown, and four receptions for 42 yards and two receiving touchdowns in the 24–10 victory. Overall, on the season, he had 986 rushing yards, six rushing touchdowns, 35 receptions, 292 receiving yards, and two receiving touchdowns. Bush signed with the Detroit Lions on March 13, 2013. Bush's contract with the Lions was a 4-year deal, worth $16 million with $4 million guaranteed. Yahoo! Sports' Jason Cole reported that Detroit planned to utilize Bush as a "three-down back" and Bush described playing for the Lions as a "running back's dream." On his debut for the Lions, he recorded 191 yards from scrimmage and a touchdown. On September 29, against the Chicago Bears, he had 139 rushing yards and a rushing touchdown. Overall, on the 2013 season, he had 1,006 rushing yards, four rushing touchdowns, 54 receptions, 506 receiving yards, and three receiving touchdowns. The 2014 season saw Bush's production drop. Overall, he finished with 297 rushing yards, two rushing touchdowns, 40 receptions, and 253 receiving yards. On February 25, 2015, Bush was released by the Lions. Bush wore 21 with Detroit. On March 18, 2015, Bush signed with the San Francisco 49ers. His 1-year contract was for $2.5 million, with $500,000 guaranteed, and a $500,000 signing bonus. On September 14, 2015 in the 49ers season opener, Bush left the game with a leg injury. On November 1, 2015, during a game against the St. Louis Rams, Bush slipped on the concrete surrounding the field at the Edward Jones Dome and crashed into the wall. He suffered a season-ending tear of his left meniscus. In limited action, he had 28 rushing yards and 19 receiving yards on the 2015 season. On January 8, 2016, it was announced that Bush is suing the St. Louis Rams, St. Louis Regional Convention and Sports Complex Authority and the St. Louis Convention and Visitors Commission, contending that what he described as a "concrete ring of death" around the field caused his injury. On June 13, 2018, the St. Louis Post-Dispatch reported that Bush had won the lawsuit and that the Rams were ordered to pay Bush $12.45 million in damages: $4.95 million in compensatory damages and $7.5 million in punitive damages. In making the ruling, the judge left the Rams as the sole defendant, dismissing the convention authority and sports complex from the suit. On August 1, 2016, Bush signed with the Buffalo Bills on a one-year deal. Bush rushed for his first touchdown, and only rushing touchdown of the 2016 season, with the Bills on October 23, 2016. Bush finished the season with 7 catches for 90 yards, and 12 carries for –3 yards and a touchdown—making him the first player in NFL history, other than quarterbacks, to carry the ball at least 10 times and have negative yardage for a season. On December 15, 2017, Bush announced his retirement from the NFL. At one time Bush dated WWE Diva Eve Torres while at USC. Bush then dated Kim Kardashian. Their relationship began after Matt Leinart introduced them at the 2007 ESPY Awards. They split on July 27, 2009 and got back together on September 28, 2009. Bush was romantically linked to country singer Jessie James in 2010. Bush began dating Armenian dancer Lilit Avagyan in 2011  and two married on July 12, 2014. The couple have three children: daughter, Briseis (born May 6, 2013)  and sons, Uriah (b. July 2015) and Agyemang (b.September 2, 2017). In September 2014, while Bush was a guest on the Boomer and Carton radio show, he shared some thoughts on Adrian Peterson and corporal punishment. In that appearance he is quoted as saying, "I most definitely discipline my daughter. I have a 1-year-old daughter, and I discipline her. Obviously, every person is different, and I definitely will use my best judgment to discipline her depending on the situation and what happens. I definitely will try to obviously not leave bruises or anything like that on her, but I definitely will discipline her, harshly, depending on what the situation is." Bush was featured almost shirtless on the February 2010 cover of Essence as part of an issue about "Black Men, Love & Relationships." However, this appearance generated controversy as some among the magazine's readers took offense to Bush on the cover of such an issue; at the time he was involved with Kim Kardashian and Bush was accused of only dating non-black women. Also in 2010, Bush's fundraising work for organizations that benefit Haiti and diamond-producing countries in Africa earned him a nomination for the VH1 Do Something Awards. Specifically, Bush worked on behalf of the Diamond Empowerment Fund, visiting Botswana and South Africa and raising money for education there. He is a founding member of the Fund's Athletes for Africa program. The awards show, produced by VH1, is dedicated to honoring people who do good and is powered by Do Something, an organization that aims to empower, celebrate, and inspire young people. In March 2012, Bush became a partner and spokesperson for skincare company Barc, makers of BumpDown Razor Bump Relief. ^ a b Smith, Erick (September 14, 2010). "Reggie Bush announces he is giving back his Heisman Trophy". USA Today. Retrieved September 14, 2010. ^ a b Pennington, Bill. (September 14, 2010) Bush, Ineligible for ’05, Returns His Heisman. New York Times. September 14, 2010. Retrieved on November 3, 2011. ^ a b "Bio". ReggieBush.com. Reggie Bush. Retrieved January 23, 2012. ^ Schrotenboer, Brent (December 8, 2005). "Trophy hopeful Bush from humble beginnings, tries to stay that way". San Diego Union-Tribune. Retrieved October 11, 2012. ^ Thamel, Pete (December 10, 2004). "Former High School Teammates Reuniting as Heisman Finalists". The New York Times. ISSN 0362-4331. Retrieved March 13, 2018. ^ "The U.S. Army All-American Bowl". www.army.mil. Retrieved March 13, 2018. ^ "Reggie Bush College Stats". College Football at Sports-Reference.com. Retrieved March 13, 2018. ^ "Reggie Bush 2003 Game Log". College Football at Sports-Reference.com. Retrieved March 13, 2018. ^ "2004 Heisman Trophy Voting". College Football at Sports-Reference.com. Retrieved March 13, 2018. ^ "Consensus All-America Teams (2000-2009)". College Football at Sports-Reference.com. Retrieved March 13, 2018. ^ a b c d "Reggie Bush Draft Profile". FoxSports.com. Archived from the original on May 16, 2006. Retrieved July 21, 2006. ^ "Reggie Bush 2004 Game Log". College Football at Sports-Reference.com. Retrieved March 13, 2018. ^ "2005 Heisman Trophy Voting". College Football at Sports-Reference.com. Retrieved March 13, 2018. ^ "AP Player of the Year Award Winners". College Football at Sports-Reference.com. Retrieved March 13, 2018. ^ "Walter Camp Player of the Year Award Winners". College Football at Sports-Reference.com. Retrieved March 13, 2018. ^ "Doak Walker Award Winners". College Football at Sports-Reference.com. Retrieved March 13, 2018. ^ "Reggie Bush 2005 Game Log". College Football at Sports-Reference.com. Retrieved March 13, 2018. ^ "2005 USC Trojans Stats". College Football at Sports-Reference.com. Retrieved March 13, 2018. ^ Schrotenboer, Brent (December 8, 2005). "Trophy hopeful Bush from humble beginnings, tries to stay that way". SignOnSanDiego.com. Archived from the original on September 9, 2006. Retrieved August 28, 2006. ^ "USC's Bush wins Heisman by monumental margin". Associated Press. December 11, 2005. Retrieved August 28, 2006. ^ "USC's Bush wins Heisman by monumental margin". ESPN.com. December 11, 2005. Retrieved March 13, 2018. ^ "Rose Bowl - Texas at USC Box Score, January 4, 2006". College Football at Sports-Reference.com. Retrieved March 13, 2018. ^ Schrotenboer, Brent; Trotter, Jim (April 23, 2006). "Reggie Bush's parents face questions about home". San Diego Union-Tribune. Retrieved September 17, 2014. ^ Robinson, Charles; Cole, Jason (September 15, 2006). "Cash and carry". Yahoo! Sports. Retrieved September 17, 2014. ^ Farmer, Sam; Wharton, David (September 23, 2006). "After Carroll Reaches Out, Upshaw Seeks Agent Solution". Los Angeles Times. Retrieved September 17, 2014. ^ "Bush, family sued by sports marketer for nearly $300,000 in cash, gifts – College Football". ESPN. November 1, 2007. Retrieved September 20, 2010. ^ Pugmire, Lance. NCAA combines investigations into USC athletics. Los Angeles Times, April 9, 2009. ^ "Suit vs. Bush to proceed in court". Associated Press. December 28, 2009. Retrieved January 9, 2010. ^ "Reggie Bush reaches settlement in civil suit", Los Angeles Times April 21, 2010. ^ Anthony McCartney (November 21, 2012). "Judge says NCAA 'malicious' in USC investigation". College Football. ^ USC punished with two-year football posteason ban. ESPN, June 11, 2010. ^ "NCAA infraction report" (PDF). Retrieved September 20, 2010. ^ Mandel, Stewart. With harsh USC penalties, NCAA sends warning to all elite programs. Sports Illustrated, June 10, 2010. ^ David Leon Moore, "USC AD Pat Haden gets apology from Reggie Bush", USA Today, August 13, 2010. ^ Gary Klein, "USC Athletic Director Pat Haden gets a phone call, but no apology, from Reggie Bush", Los Angeles Times, August 13, 2010. ^ "Heisman Trust leader denies decision to revoke Bush's trophy". NFL. September 7, 2010. Retrieved September 20, 2010. ^ "Reggie Bush's Heisman to stay vacated". ESPN. September 16, 2010. Archived from the original on January 10, 2016. ^ "Reggie Bush's Heisman Trophy reportedly returned to Bush family". nola.com. July 19, 2011. Retrieved July 19, 2011. ^ "Reggie Bush returned Heisman", ESPN.com, August 16, 2012. ^ "Awards | Walter Camp Football Foundation". Waltercamp.org. Retrieved September 20, 2010. ^ "Doak Walker Award". Smu.edu. Archived from the original on September 15, 2011. Retrieved September 20, 2010. ^ Julie Jacobson/The Associated Press. "New Orleans Saints' Reggie Bush first player to forfeit Heisman Trophy". NOLA.com. Retrieved September 20, 2010. 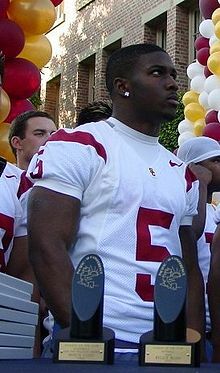 ^ "Player Bio: Reggie Bush – University of Southern California Official Athletic Site". Usctrojans.cstv.com. Archived from the original on May 26, 2009. Retrieved September 20, 2010. ^ "EA Drafts Heisman Trophy Winner Reggie Bush as Cover Athlete". April 28, 2006. Retrieved July 21, 2006. ^ "25 Greatest Players In College Football – College Football". ESPN. January 2, 2008. Retrieved September 20, 2010. ^ "Reggie Bush College Stats - College Football at Sports-Reference.com". College Football at Sports-Reference.com. ^ Klein, Gary (April 1, 2009). "Nothing compared to USC's 2006 Pro Day". Los Angeles Times. Retrieved June 24, 2015. USC's 2006 event [was] regarded throughout the college and pro football worlds as the pro day to end all pro days. Back then, pro day was open to the public. So a huge crowd showed up to catch a glimpse of Heisman Trophy winners Reggie Bush and Matt Leinart . . . and others. ^ Farmer, Sam (April 3, 2006). "Showcase Is a Mixed Bag at USC". Los Angeles Times. Retrieved June 24, 2015. Bush, meanwhile, ran the 40-yard dash in a sizzling 4.33 seconds – he said he was hoping for an even better time – and had a vertical jump of 40 1/2 inches. Not surprisingly, both were the best performances of the day. 'I think I proved I should be the No. 1 pick,' he said. ^ "Texans ink DE Williams, to draft him No. 1". NFL. April 28, 2006. Archived from the original on June 15, 2006. Retrieved July 21, 2006. ^ "2006 NFL Draft Listing". Pro-Football-Reference.com. Retrieved March 13, 2018. ^ Pasquarelli, Len (April 28, 2006). "Snubbing Bush a Texans-size blunder". ESPN. Retrieved July 21, 2006. ^ "Reggie Bush signs deal with Adidas". Associated Press. April 26, 2006. Retrieved July 21, 2006. ^ 2006 NFL Combine Results – Top 100 Players at ESPN.com (accessed June 24, 2015). ^ "Reggie Bush won't get his No. 5 this year". Associated Press. May 23, 2006. Archived from the original on August 12, 2005. Retrieved July 21, 2006. ^ "Saints rookie Reggie Bush inherits McAfee's jersey number". ESPN.com. Retrieved March 13, 2018. ^ "Saints notebook: Reggie Bush calls NFL career so far 'humbling'". Palm Beach Post. Retrieved March 13, 2018. ^ Farmer, Sam (September 1, 2006). "Reggie Bush is putting down roots in New Orleans". Seattle Times. Archived from the original on June 29, 2011. Retrieved November 24, 2008. ^ "New Orleans Saints at Cleveland Browns - September 10th, 2006". Pro-Football-Reference.com. Retrieved March 13, 2018. ^ "New Orleans Saints at Tampa Bay Buccaneers - November 5th, 2006". Pro-Football-Reference.com. Retrieved March 13, 2018. ^ "New Orleans Saints at Pittsburgh Steelers - November 12th, 2006". Pro-Football-Reference.com. Retrieved March 13, 2018. ^ "San Francisco 49ers at New Orleans Saints - December 3rd, 2006". Pro-Football-Reference.com. Retrieved March 13, 2018. ^ "New Orleans Saints at Dallas Cowboys - December 10th, 2006". Pro-Football-Reference.com. Retrieved March 13, 2018. ^ "New Orleans Saints at New York Giants - December 24th, 2006". Pro-Football-Reference.com. Retrieved March 13, 2018. ^ "Carolina Panthers at New Orleans Saints - December 31st, 2006". Pro-Football-Reference.com. Retrieved March 13, 2018. ^ "Divisional Round - Philadelphia Eagles at New Orleans Saints - January 13th, 2007". Pro-Football-Reference.com. Retrieved March 13, 2018. ^ "NFC Championship - New Orleans Saints at Chicago Bears - January 21st, 2007". Pro-Football-Reference.com. Retrieved March 13, 2018. ^ Klis, Mike (January 22, 2007). "The Denver Post – Bush league move inflames Chicago". Denver Post. Archived from the original on July 15, 2012. Retrieved September 20, 2010. ^ Schwartz, Paul (January 22, 2007). "Bush League". New York Post. Archived from the original on January 11, 2009. Retrieved September 20, 2010. ^ "The SouthtownStar :: Sports". Daily Southtown. January 22, 2007. Archived from the original on October 12, 2007. Retrieved September 20, 2010. ^ "Yahoo! Sports – Sports News, Scores, Rumors, Fantasy Games, and more". Sports.yahoo.com. Archived from the original on April 4, 2007. Retrieved September 20, 2010. ^ "New Orleans Saints at Indianapolis Colts - September 6th, 2007". Pro-Football-Reference.com. Retrieved March 13, 2018. ^ "New Orleans Saints at Tampa Bay Buccaneers - September 16th, 2007". Pro-Football-Reference.com. Retrieved March 13, 2018. ^ "Tennessee Titans at New Orleans Saints - September 24th, 2007". Pro-Football-Reference.com. Retrieved March 13, 2018. ^ "Bush out vs. Falcons, likely to miss rest of season". ESPN.com. December 7, 2007. Retrieved March 13, 2018. ^ "Reggie Bush 2007 Game Log". Pro-Football-Reference.com. Retrieved March 13, 2018. ^ "Tampa Bay Buccaneers at New Orleans Saints - September 7th, 2008". Pro-Football-Reference.com. Retrieved March 13, 2018. ^ "New Orleans Saints at Denver Broncos - September 21st, 2008". Pro-Football-Reference.com. Retrieved March 13, 2018. ^ "Minnesota Vikings at New Orleans Saints - October 6th, 2008". Pro-Football-Reference.com. Retrieved March 13, 2018. ^ "Bush ties Boldin's NFL record with 200th catch in 34th game". ESPN. Associated Press. October 12, 2008. Retrieved October 13, 2008. ^ "New Orleans Saints at Tampa Bay Buccaneers - November 30th, 2008". Pro-Football-Reference.com. Retrieved March 13, 2018. ^ "Atlanta Falcons at New Orleans Saints - December 7th, 2008". Pro-Football-Reference.com. Retrieved March 13, 2018. ^ "Reggie Bush 2008 Game Log". Pro-Football-Reference.com. Retrieved March 13, 2018. ^ Saints: Bush had 'microfracture' surgery[permanent dead link]. Retrieved on January 7, 2009. ^ Yasinskas, Pat (August 5, 2009). "New Orleans Saints tackle report that Reggie Bush suffered setback". ESPN. ^ "Reggie Bush 2009 Game Log". Pro-Football-Reference.com. Retrieved March 13, 2018. ^ "Reggie! Reggie!". Lafayette Daily Advertiser. AP. January 19, 2009. Archived from the original on January 10, 2016. Retrieved January 25, 2010. ^ "Divisional Round - Arizona Cardinals at New Orleans Saints - January 16th, 2010". Pro-Football-Reference.com. Retrieved March 13, 2018. ^ "Saints beat Vikings in OT, reach 1st Super Bowl". Sports Illustrated. January 24, 2010. Retrieved February 2, 2010. ^ "NFC Championship - Minnesota Vikings at New Orleans Saints - January 24th, 2010". Pro-Football-Reference.com. Retrieved March 13, 2018. ^ Gough, Martin (February 8, 2010). "Saints upset Colts in Super Bowl". BBC Sport. Retrieved February 8, 2010. ^ "Super Bowl XLIV - New Orleans Saints vs. Indianapolis Colts - February 7th, 2010". Pro-Football-Reference.com. Retrieved March 13, 2018. ^ news: Bush's broken leg expected to keep him out six weeks. NFL (September 21, 2010). Retrieved on November 3, 2011. ^ "Reggie Bush 2010 Game Log". Pro-Football-Reference.com. Retrieved March 13, 2018. ^ Kelly, Omar. "Miami Dolphins working to finalize deals for Reggie Bush, Kyle Orton". Chicago Tribune. Archived from the original on July 30, 2011. Retrieved July 28, 2011. ^ "2011 Miami Dolphins Statistics & Players". Pro-Football-Reference.com. Retrieved March 13, 2018. ^ "Miami Dolphins at Kansas City Chiefs - November 6th, 2011". Pro-Football-Reference.com. Retrieved March 13, 2018. ^ "Miami Dolphins at New York Giants - October 30th, 2011". Pro-Football-Reference.com. Retrieved March 13, 2018. ^ "Oakland Raiders at Miami Dolphins - December 4th, 2011". Pro-Football-Reference.com. Retrieved March 13, 2018. ^ "Philadelphia Eagles at Miami Dolphins - December 11th, 2011". Pro-Football-Reference.com. Retrieved March 13, 2018. ^ "Miami Dolphins at Buffalo Bills - December 18th, 2011". Pro-Football-Reference.com. Retrieved March 13, 2018. ^ "Reggie Bush 2011 Game Log". Pro-Football-Reference.com. Retrieved March 13, 2018. ^ "Miami Dolphins at Houston Texans - September 9th, 2012". Pro-Football-Reference.com. October 31, 2017. Retrieved March 13, 2018. ^ "Oakland Raiders at Miami Dolphins - September 16th, 2012". Pro-Football-Reference.com. Retrieved March 13, 2018. ^ "Buffalo Bills at Miami Dolphins - December 23rd, 2012". Pro-Football-Reference.com. Retrieved March 13, 2018. ^ "Reggie Bush 2012 Game Log". Pro-Football-Reference.com. Retrieved March 13, 2018. ^ "Lions add Reggie Bush to fold," ESPN (March 13, 2013). Retrieved June 13, 2013. ^ "Reggie Bush's contract worth up to $16 million". March 13, 2013. ^ Wachtel, Kyle. "The Potential of Reggie Bush in Detroit". ForensicFantasy.com. Retrieved April 15, 2013. ^ "Week 1: Top 10 beast performances". NFL Videos. ^ "Chicago Bears at Detroit Lions - September 29th, 2013". Pro-Football-Reference.com. Retrieved March 13, 2018. ^ "Reggie Bush 2013 Game Log". Pro-Football-Reference.com. Retrieved March 13, 2018. ^ "Reggie Bush 2014 Game Log". Pro-Football-Reference.com. Retrieved March 13, 2018. ^ Wesseling, Chris (February 25, 2015). "Reggie Bush released by Detroit Lions". nfl.com. Retrieved February 25, 2015. ^ Patra, Kevin. "Reggie Bush agrees to join New York Jets". NFL.com. Retrieved March 14, 2015. ^ "Reggie Bush contract could be worth $2.5 million". ^ Matt Fitzgerald. "Reggie Bush Injury: Updates on 49ers RB's Knee and Return". Bleacher Report. ^ "Reggie Bush 2015 Game Log". Pro-Football-Reference.com. Retrieved March 13, 2018. ^ Ben Rohrbach (January 8, 2016). "More bad news, Rams fans: Reggie Bush sues St. Louis over injury". Yahoo Sports. Archived from the original on February 7, 2016. ^ a b "Rams ordered to pay Bush $12.5M for injury". ESPN.com. Retrieved June 13, 2018. ^ Orr, Conor (August 1, 2016). "Reggie Bush to sign one-year deal with Buffalo Bills". NFL.com. Retrieved August 1, 2016. ^ "Reggie Bush 2016 Game Log". Pro-Football-Reference.com. Retrieved March 13, 2018. ^ Veronica, Nick (January 1, 2017). "Reggie Bush becomes first RB since NFL merger with negative yards on 10-plus carries". Buffalo News. Retrieved January 2, 2017. ^ Lewis, Edward (December 15, 2017). "Reggie Bush on his NFL career: 'I'm done. For sure'". NFL.com. ^ a b c "Reggie Bush Stats". ESPN Internet Ventures. Retrieved February 11, 2014. ^ "MTO EXCLUSIVE: Did Y'all Know That Reggie Bush's OLD GIRLFRIEND ... Before Kim K ... Is A PROFESSIONAL WRESTLER????". Mediatakeout.com. August 26, 2008. Archived from the original on September 5, 2012. Retrieved September 20, 2010. ^ "The Saint and The Sinner". GQ. April 2009. ^ "Kim Kardashian and Reggie Bush Are Back Together!". Retrieved September 30, 2009. ^ "Kim K.'s Ex Reggie Bush Dating Singer Jessie James?!". E! Online. Retrieved October 10, 2017. ^ "Reggie Bush's First Tango in Paris With New Galpal". Gossip Extra. July 19, 2012. Retrieved October 13, 2015. ^ "Reggie Bush Marries Lilit Avagyan". people.com. July 12, 2014. ^ Eggenberger, Nicole (May 7, 2013). "Reggie Bush's Fiancee Gives Birth to Baby Girl". Usmagazine.com. Retrieved March 12, 2019. ^ Webber, Stephanie (July 14, 2015). "Reggie Bush and Wife Welcome Son". Usmagazine.com. Retrieved March 12, 2019. ^ "Reggie Bush, Lilit Avagyan Welcome Baby No. 3: Find Out His Name!". ^ Tom Ley (September 17, 2014). "Reggie Bush Admits To "Harshly" Disciplining His 1-Year-Old Daughter". Deadspin. ^ "adidasbecksandbush". Sdmlsproject.com. Archived from the original on October 1, 2011. Retrieved September 20, 2010. ^ "Reggie Bush inks Sirius Radio Announcer Deal | lalate news – America's Fastest Growing Celebrity News Site!". News.lalate.com. Retrieved September 20, 2010. ^ "2007 BET Awards official site". Archived from the original on January 17, 2011. Retrieved March 23, 2010. ^ "Best Male Athlete at BET Awards 2009 official site". Archived from the original on May 28, 2010. Retrieved March 23, 2010. ^ "Essence Takes Heat For Reggie Bush Cover". BET.com. January 7, 2010. Retrieved September 20, 2010. ^ "Founding Members of Athletes for Africa". Diamond Empowerment Fund. Retrieved July 15, 2010. ^ "Home page". Do Something. Retrieved July 15, 2010. 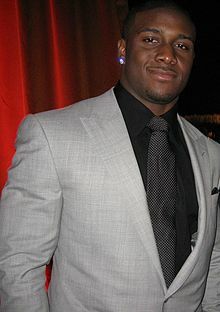 ^ "Football Star Reggie Bush Becomes Partner in Barc Skincare, Named Official Spokesperson". GlobeNewswire. March 29, 2012. Retrieved March 16, 2013. Wikimedia Commons has media related to Reggie Bush.